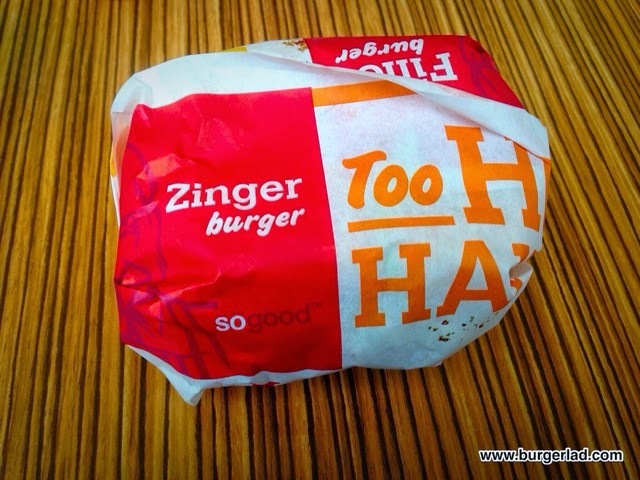 What does the Zinger Burger taste like? Picture a disco mirrorball hanging from the roof of your mouth and instead of light, it’s taste bouncing around your mouth like a tingle wave. 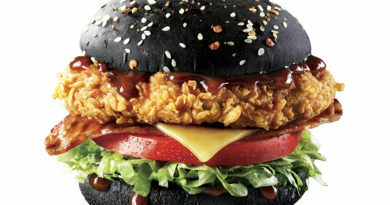 And that’s what the Zinger Burger tastes like. 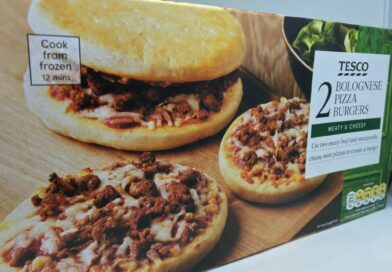 Price: £3.49 for the burger only (at Motorway Service Station). Motorway service station at lunchtime. One of my worst nightmares, but unfortunately a necessity sometimes. At least we got a seat. This particular one had a BK, a Starbucks, Papa John’s Pizza and a KFC. 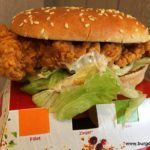 I sat down and immediately intended to have the aforementioned Summer Whopper, because Burger Lad® had mentioned it once or twice or seven times, and The Admiral is good like that. So I walked over to the BK counter where one member of staff was busy with a couple of people, and another was bustling around in the back. Firstly, I felt two seemed too few for lunchtime but then realised the more pertinent problem was the current customers. The conversation went on for ages and ages and it became apparent they were ordering for seemingly a coach-full of Chinese tourists with all manner of queries and alterations (including one “do you have a microwave so I can heat up this plastic container of noodles I seem to have brought with me?”). Before my eyes, the till went slowly up over £100 and eventually settled at around £130. All of this took a long time – did I mention that? Eventually it was my turn. “A summer barbeque Whopper please”. I’m sorry, we are sold out of whoppers. 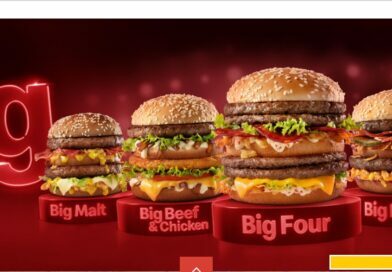 Obviously there was a direct connection between the massive order and my whopper-less predicament. I mumbled and shuffled off to KFC, only to be confronted by a massive queue formed of what appeared to be a giggling school group. You see, motorway services at lunchtime = nightmare. Fortunately, salvation was there in the form of KFC’s self-order machine. Giggling schoolgirls don’t have credit cards, so I was able to bypass the queue and the excruciating conversations about the latest Gordon Bieber song and the like. Swiftly, I had a Zinger with cheese in my hand and was unpacking it. So, three weeks after first arriving at the service station, I took my first bite. 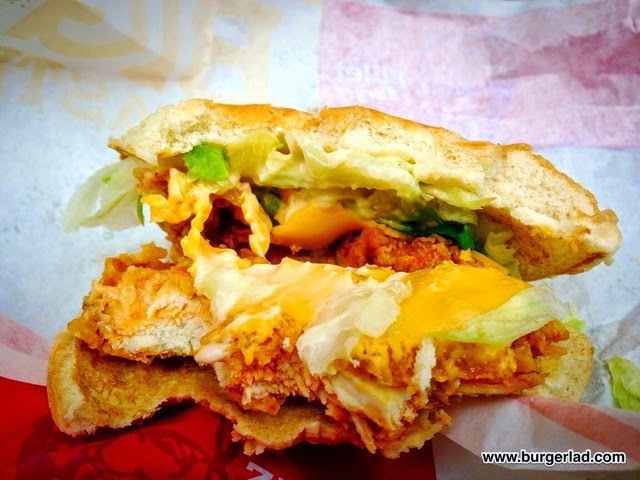 I like the buns KFC uses – soft and squidgy, and just big enough to fit the proprietary chicken, which poked its enticing crunchy coating out the ends. 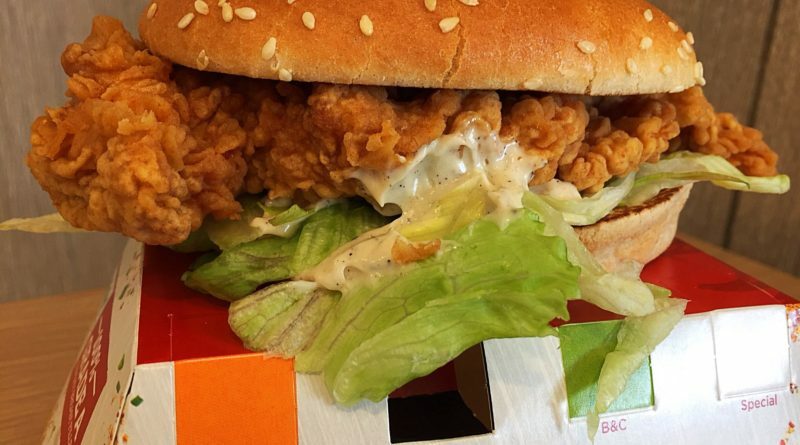 I really like the stuff KFC coats their chicken with so I knew I was going to enjoy it. 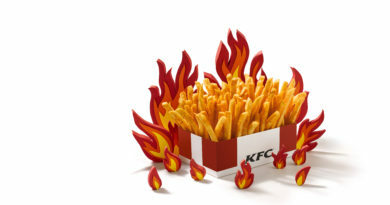 And they don’t really hold back too much on the spice in the Zinger and their hot wings. So much so, that the chicken I could see inside had hints of colour, presumably from the spices soaking in. 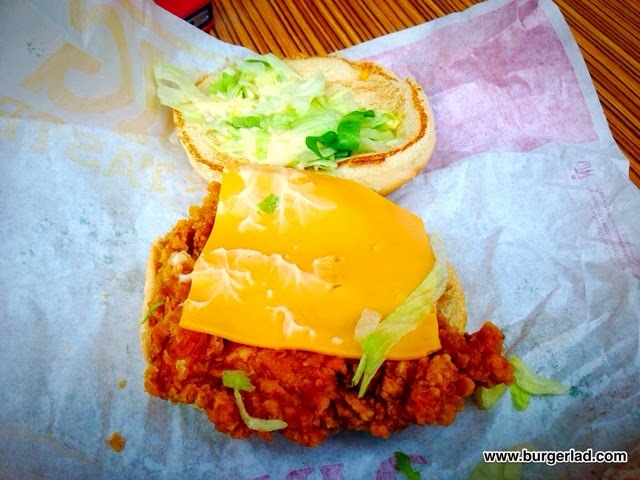 The cheese I added for 15p melted nicely into the mayo and other toppings to give a nice background to this burger, but it was most certainly the spicy chicken that led the way. It held together well. There was enough bun left until the end to help me hold and eat the final bites. The nice spicy taste lingered well beyond the final bite. I love the taste. 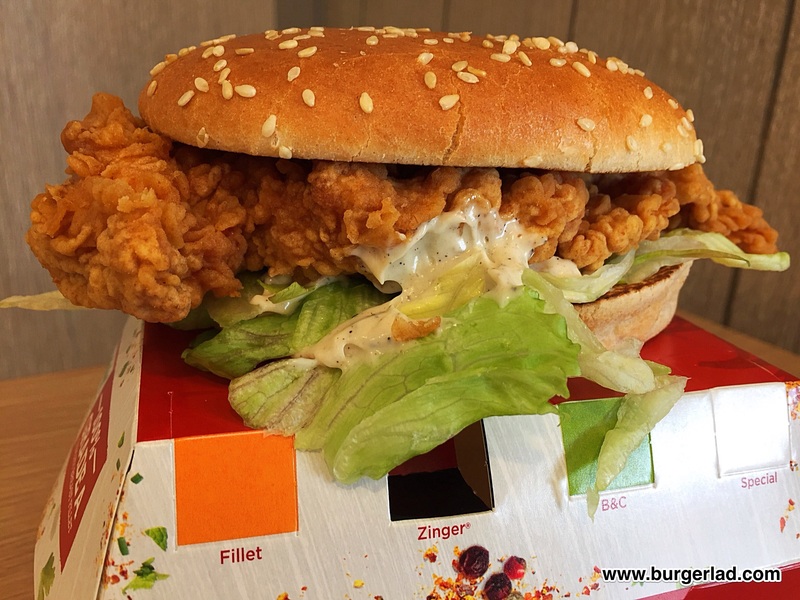 The crunchy texture is very generous, the chicken is lovely, and the spice makes it rather moreish. It didn’t last very long. I’ve had this before and I’d have it again. 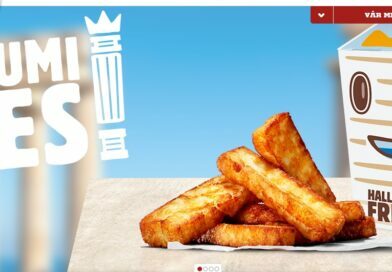 The Zinger can be “towered up” with a hash brown for 50p. Obviously this adds more calories, but if you’re in the mood, it also adds a very pleasant complementary sensation. 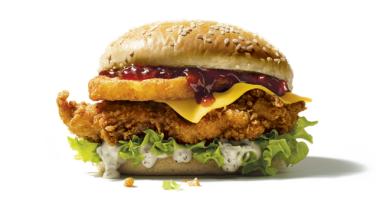 The Zinger burger then – a fast food gem and right up there among the best of the big brand staples. I meant to write 'never fails to please', I must have been drunk! 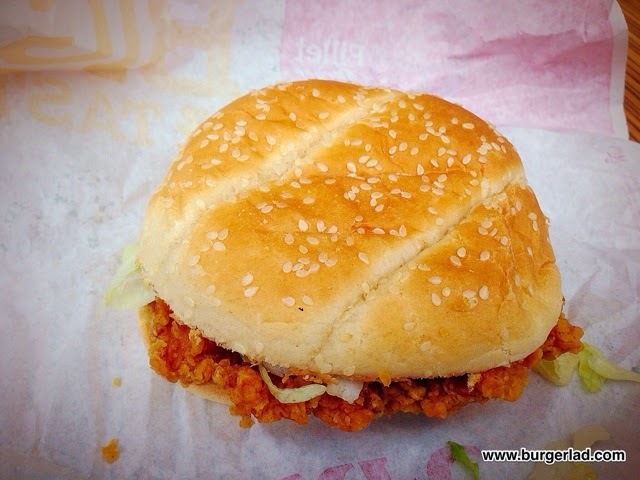 XD Eating a Zinger again now… reading the same review as I do and commenting again. Only reason why it gives your boyfriend an upset stomach is because he clearly cant handle spicy food. 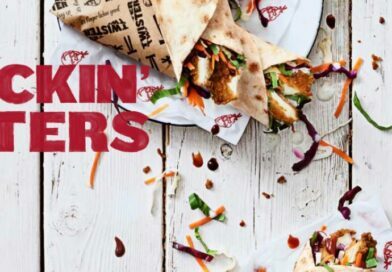 Never heard of anyone having an upset tummy after a zinger what a light weight haha maybe he should just stick to british fish and chips eh no mayo.. corrr might be too spicy.